New Super Version BMW ICOM A2+B+C is the most powerful Diagnostic Tool, with perfectly matched firmware and software (version is the same with 4S shop). Holen Sie sich jetzt für 3 Gründe: A2+R2 makes running speed increased by 30%; new number makes it stable; Engineer Software: BMW AG hidden features of all models brush writing, all modules individually programmed, replace the old parts programming and coding. 3. BMW ICOM A2 Software is very easy to install. Once insert hard disk into your computer can automatically install. 4. Compatible with many computers: D630, D620, E6420, E6400 E49, E420, E430, G570, X201, X200, X201T, T60, T61, T400, X61T, X60, X60 computers. No time limiation for use. 5. Fast running speed. This version BMW ICOM A2, software running speed increase by 30%. 6. Fully-new Serial Numbers (S/N), work stably. 4. The hard disk can run on most intel-based computers with 4GB memory. Hinweis: This hardware update is not for every customer, ONLY for those who owns the newest software and the newest software cannot be connected or cannot diagnose vehicle, but the old version icom software for bmw can diagnose the vehicle. 1. Use Network cable to connect Super version BMW ICOM A2 (item NO. SP168-BO) with computer, charge Super version BMW ICOM A2 with 12V power adapter or connect Super version ICOM A2 with the BMW vehicle. 3. Click "Update Firmware", you will see ICOM firmware version information. 4. Choose file "ICOM-BootImage-01-13-00.bin", set image type to SYSTEM, click "Send the file". 5. When it pops up "Write the image file to the flash? ", click "Yes", then ICOM indicator light will turn red. 6. When it pops up "The SYSTEM IMAGE update was successfull", click "Update Firmware". 7. Choose "ICOM-ApplicationImage-01-18-00.bin", set image type to APPLICATION, click "Send the file", it will spend several minutes since the file is a little bit large. 8. When it pops up "Write the image file to the flash? ", click "Yes", then the ICOM indicator light will turn red for the second times. 9. When it finish upgrading, click "reboot". Secondly choose the bigger file "ICOM-ApplicationImage-01-18-00.bin", then set image type to APPLICATION. 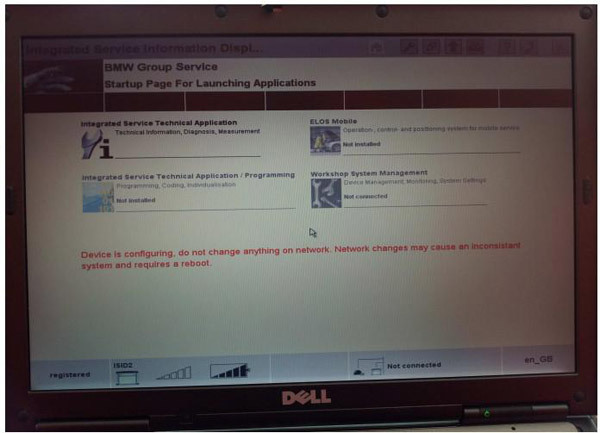 When you use BMW software, after connect internet, it may meet problem. This kind of problem, pleas turn off the internet, then do as the video on the left, your problem will be solved. Q: Does BMW ICOM A2(item number:SP168-BO) software wor with OPS? A: No, it cannot use with OPS. Q: I bought bmw icom a2 from you before, the hdd is the one with dongle, now I would like to buy your V2014.4 bmw icom a2 software, is that OK? A: Theoratically you cna use v2014.4 bmw icom a2 software directly, if not, you can upate the hardware, then it will be ok.
Q: When I choose ISTA, bmw icom a2 shows this following error "device is configuring"? How to do? A: This is not error information please wait for 5 minutes, after five minuter, if the hint is disappear, it means your laptop is compatible with our software.